You wake up most days full of dread about the day ahead. You sometimes feel like the whole world is an anxiety trigger . You are one big ball of stress unable to relax. You feel alone and like nobody gets you. You often get stuck ruminating about the past or worrying about the future. You have been anxious for so long you don’t even remember what it’s like to be calm. You have tried various anxiety remedies but nothing seems to provide permanent relief. You are sick and tired of people telling you to “just take deep breaths” and “just think about something else” and “just face your fears”. You are afraid you were simply born anxious and nothing you try will ever work. Hey there, I’m Anni and I teach introverts and Highly Sensitive People (HSPs) how to find calm. And why am I qualified to be your guide on this journey? Because I did it myself. After stumbling in the darkness for a long time, I finally made it all the way to the light at the end of the tunnel. I know where you are coming from. I know what it’s like to be constantly stressed, constantly exhausted, and constantly fighting tension headaches. I know what it’s like to dread even the most mundane tasks like driving yourself to the grocery store or making a phone call. I know what it’s like to waver between what your sensitive being needs to thrive and what the world wants from you. I know what it’s like to feel stuck and afraid that this is what your life will be like forever and ever. I also know the road to recovery. I know what works and what doesn’t. I know the obstacles and ways to overcome them. I know how to implement it all without compromising your introvert nature or your needs as an HSP. Above all, I know that it’s POSSIBLE to feel better. A LOT better. What if you could sleep like a baby again? What if you could wake up every morning feeling energized and looking forward to the day ahead? 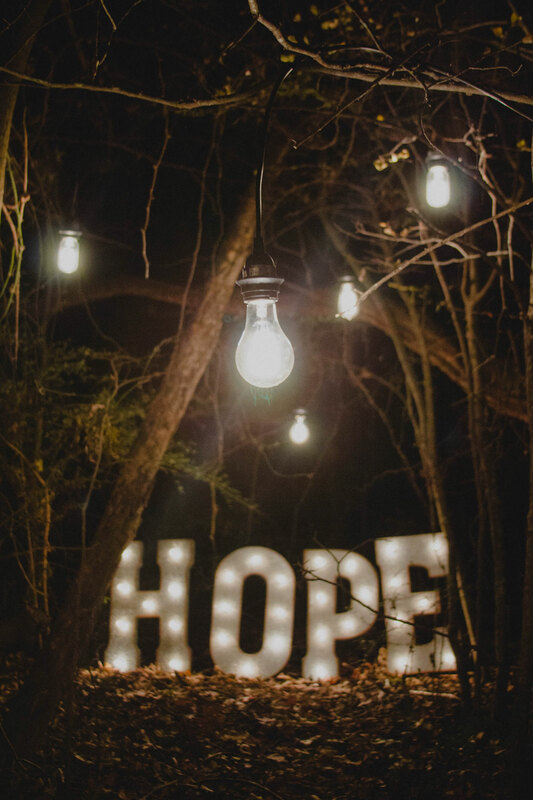 What if you could go out into the world from a place of strength rather than fear? What if you had a system for dealing with the stresses of life so that they never get out of control? What if you knew how to process fears and worries so that you were able to let them go? What if you could feel calm and relaxed the vast majority of the time? What if somebody showed you exactly how to get there? One step at a time? I believe you can have all this and more. That’s what the Conquer Your Anxiety eBook Bundle is for. I created it for you. The secrets to a good night’s sleep even if your mind is usually running a million miles a minute and you spend most of the night tossing and turning. Detailed strategies to teach your body how to relax again even if you have tried breathing and relaxation exercises before without much success. The 5 sneaky ways your diet can interfere with your mental health. The formula to banish anxiety-fueling beliefs and help you finally let go of people pleasing, comparing, and perfectionism for good. Tricks to setting boundaries and becoming the boss of your life even if you hate confrontation. Powerful time management tools that will enable you to make room for self care and recharging. A step-by-step process for dealing with looping fears and worries so that you can put your brainpower to better use. Super simple tactics to enhance your sense of security and make your brain less prone to freaking out over every little thing. Ideas for developing inner strength so that you never feel stuck again. And here’s what you’ll get with the Conquer Your Anxiety eBook Bundle. This brief eBook explains what anxiety is, what causes it, and how to differentiate it from other related conditions. Once you understand exactly what is happening with your body and mind, you will be in a better position to make the changes necessary to bring yourself back into equilibrium. In this brief eBook, I share the 10 secrets that have enabled me to overhaul my sleeping, exercise, relaxation, eating, and thinking habits over the past few years. Your habits = Your life. To change your life, you need to change your habits. Introverts or Highly Sensitive People (HSPs) who want to reduce their stress levels, free themselves from anxiety, and live their best lives without compromising their true nature. People who are ready to make changes, but may be a little overwhelmed by it all and not sure where to start. People who have already tried to make some changes, but found that it didn’t stick or wasn’t that helpful. People looking for a quick fix. Conquer Your Anxiety provides a long-term roadmap for following a healthy lifestyle. While some lifestyle changes can make you feel better almost immediately, many others take time to implement as well as see the full results from. People who don’t want to make any changes. Simply reading a book will not change your life. With the step-by-step nature and clear assignments, I have made it as easy as possible for you to take the necessary action. But I’m not able to personally make you do anything. If you want to keep doing everything exactly the same as you always have and you don’t want to change anything, then this is not the book for you. I want you to be happy with your purchase. If this eBook bundle turns out to not be a good fit for you, just email me within 30 days, let me know what didn’t work out, and I will send you a full refund. Ready to conquer your anxiety? For a limited time I'm offering the whole bundle (valued at $80) for only $37! I have both anxiety and depression. Is this eBook bundle for me? Yes. Although full recovery from depression may require additional tools beyond those offered in Conquer Your Anxiety, all the lifestyle changes and coping skills that help with anxiety also have the potential of providing relief from depression. There are many types of anxiety. What kind of anxiety is this best for? Conquer Your Anxiety is based on my own experiences and ideas as someone with generalized and social anxiety and a past history of trauma. So those are the types of anxiety Conquer Your Anxiety is best suited for. Someone with panic disorder, specific phobias, or obsessive compulsive disorder will likely also benefit from the skills I teach, but may also require additional techniques for full recovery. I already see a psychologist and/or psychiatrist. Is this for me? Is this going to be just a repeat of what’s on your website? A few bits and pieces will sound familiar to you if you have already read every post on my website. However, a majority of the content in Conquer Your Anxiety is new. 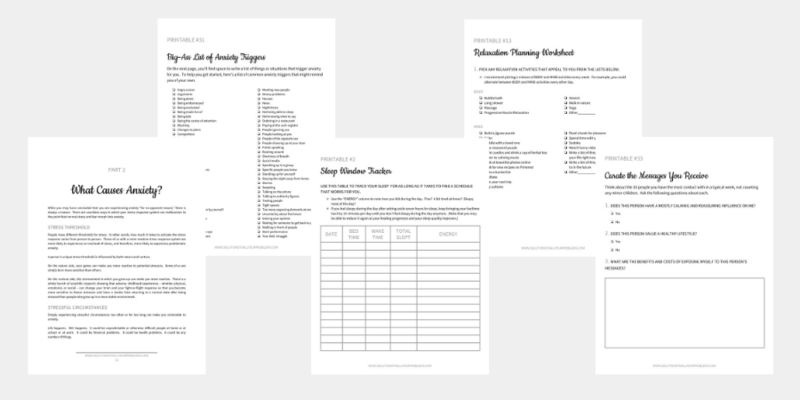 Moreover, the real strength of Conquer Your Anxiety is in the structure it gives you to actually implement changes via the step-by-step action plans and worksheets I have created. I’ve already heard it all. How will this be any different? It’s designed to get you to take action. This isn’t a self help book that you read, nod your head at in agreement, and then proceed to forget about in a couple of days. I will tell you exactly what to do and why - all you have to do is execute. 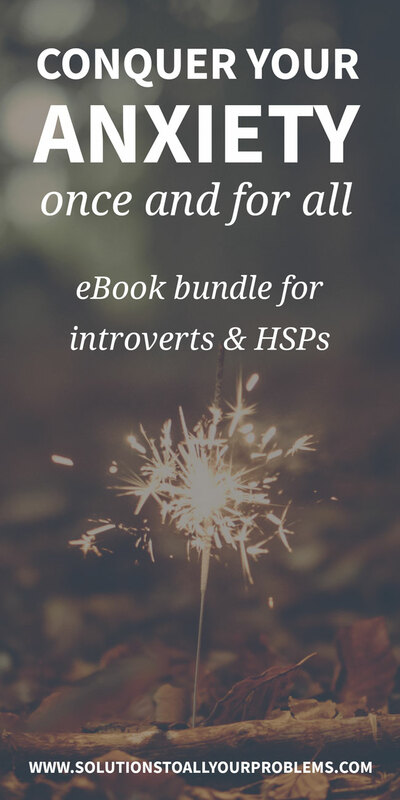 I am a highly sensitive introvert and I created this package specifically with introverts and highly sensitive people in mind. I’m not going to attempt to turn you into an outgoing party animal. I’m not going to try to pressure you to fall in line with the mainstream hectic lifestyles. I will teach you how to conquer your anxiety without changing your personality and while safeguarding the space you need for self care and recharging. I don't claim to have found the ONE miracle cure that will fix everyone's anxiety. Instead Conquer Your Anxiety uses a holistic approach that draws from many different fields of study and takes advantage of the cumulative benefits of both "body" and "mind" techniques. How will I receive the eBook bundle? When you click the "Buy Now" button, a payment box will pop up asking for your email address. From there, you will be directed to a payment page, with a choice to pay with either PayPal or a credit card. After you have entered your payment information, you will be directed to a download page. You will receive four PDF files, which you can view on any device just like any other PDFs. In addition to having the opportunity to download the bundle immediately, you will receive an email with a download link. You will also receive a second email with a receipt for your purchase. Yes, this is exactly the same as any other online purchase. Your credit card will be processed by a secure third-party payment processor (PayPal). I would be happy to answer additional questions. Just send me an email and I will get back to you as soon as possible.